Head to Pacific Fair Shopping Centre and Robina Town Shopping Centrefor plenty of shopping. 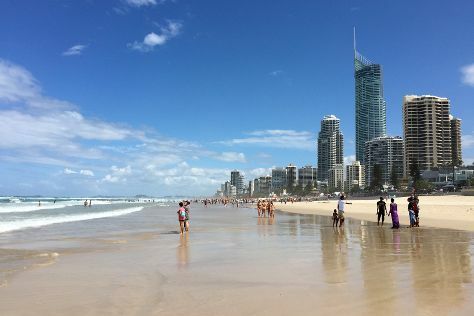 You'll get in some beach time at Surfers Paradise Beach and Burleigh Head National Park. You'll find plenty of places to visit near Gold Coast: Lamington National Park (O'Reillys Birds of Prey, Gold Coast Hinterland Great Walk, & more). Spend the 22nd (Mon) wandering through the wild on a nature and wildlife tour. The adventure continues: observe the fascinating underwater world at Sea World Theme Park, kick back and relax at Coolangatta Beach, find something for the whole family at Dreamworld, and revel in the low prices at Harbour Town Outlet Shopping Centre. To find where to stay, maps, traveler tips, and tourist information, refer to the Gold Coast tour builder website . Papeete, French Polynesia to Gold Coast is an approximately 12-hour flight. You can also do a combination of flight and train. You'll lose 20 hours traveling from Papeete to Gold Coast due to the time zone difference. Traveling from Papeete in July, you will find days in Gold Coast are a bit cooler (24°C), and nights are cooler (11°C). Wrap up your sightseeing on the 27th (Sat) early enough to travel back home.